We are doing fine. Miyu is 1 year and 5 months now and likes playing outside if it's very cold. She still cannot stand up by herself but she likes stairs very much. 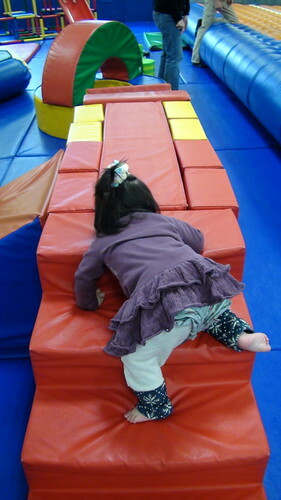 She tries them everyday and sometimes falls down... I love her back style (* v *)!!!! 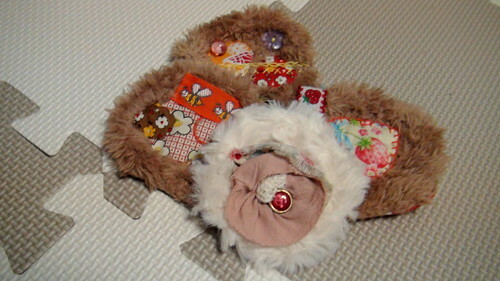 Here are some fur items I made for her. One is this bag. It has a cat face pocket because she likes cats very much. 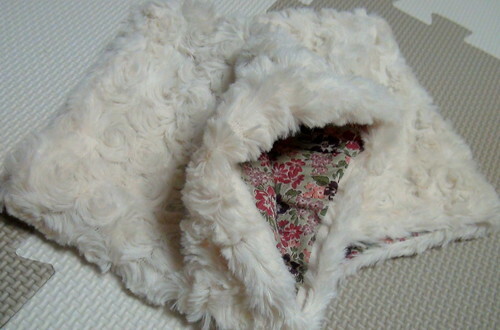 I made it with Miyu's friend's mother. She didn't sew at all before we met but now she likes sewing for her little. I'm happy to teach sewing to other mothers. I made some hair clips too. They're so easy to make. I just put my favorite buttons, ribbons and Sashiko stitches. I made my leg warmers too. They makes me very hot and comfortable. Today I got some fleece fabric and I'll teach other mothers the way of sewing them. 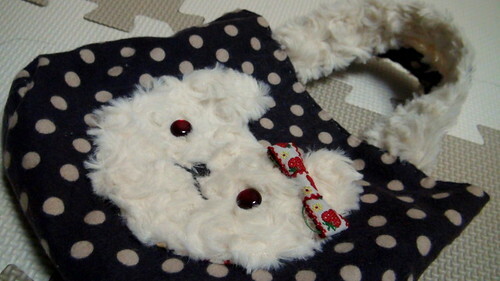 I begin small sewing classes for mothers (at no charge (* v *)!!) twice a month. I hope more people enjoy sewing for themselves and their family. In this cold season, hand craft is best. Isn't it? 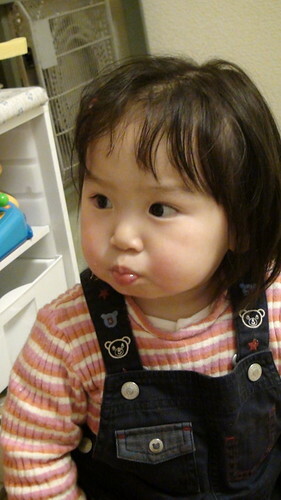 Oh, wow, Miyu is the CUTEST girl baby! Love her eyes. And her pigtails. She's getting so big! Loving all the cute things you are making her. hoo i remember when i saw your blog when you where pregnat.. i remember you called her "tomato" now she is so pretty and big. She's so beautiful- so much that it's unfair! God bless her eyes, her cheeks and her family! Miyu is such a pretty girl!!! What a nice thing to teach other moms to sew. You are very sweet. You are so kind hearted, making a free sewing class to all mothers. Sometimes satisfaction beyond cash n dollar reward right. All of your works are so cute! 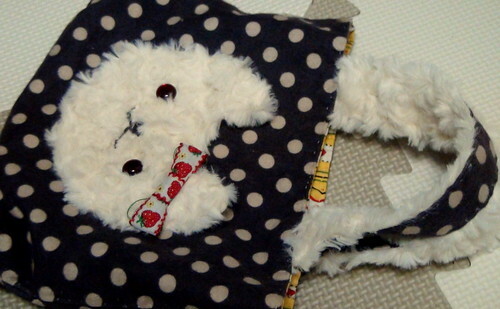 Please teach me the way of sewing. your little girl is getting so big! I love the kitty purse you made her! Where is the play space in the first photo? I would like to go there with my daughter. Your hand made goods looks so nice. I hope my daughter Kurumi and Mayu-chan play together again! Mairuru, your daughter looks great. Kisses. I really wish to be one of your friends! I love you so much, you taught me many things with your blog even without be aware. hello my name is Eva and I wrote an email recently and have received no reply guess Miyu gives a lot of work, I'm from Canary Islands, Spain and in my email I asked you for a few purses as cats and whales, I love your blog and how not to write in English it is translated with google pardon my expression. Very nice to read about your life today, Mai. You are generous to teach others your craft. 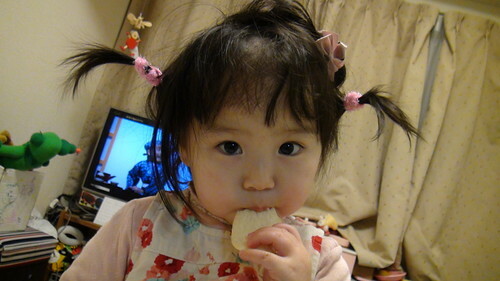 Miyu is a lovely little girl. I have only 1 daughter and she's 24 now. Your creations are wonderful and your little girl too. She's beautiful! and she's so big now! congratulations! Japan is too far, I wish you were my teacher! thank you so much for so openly sharing/documenting your work...i just finished making my first oragami drawstring bag...it was so fun! I made it with old t-shirt fabric--no worries about raw edges! It came out very nice even though i didn't measure perfectly! I will check back often. I LOVE your blog and will try your button training toy on my 20 month old.